It felt like we were the stars in a Quentin Tarantino movie: Well-dressed tourists moved out of our way as we strode down the sidewalk of Sutter Creek, the glittering mid-afternoon December sunshine in our face. Sutter Creek used to be a gold-mining town, but now it’s known for antiques and wine tasting. Most people on the street wore the understated uniform of the San Francisco Bay Area well-to-do: Simple sweaters, laid-back blue jeans, and – for the women – medium-length gray hair. This ain’t Southern California; people wear their gray hair proudly here. We stood out in this Christmas-shopping crowd. We were filthy, our faces covered with dust, our camo pants and blue jeans blood-spattered, my enormous hunting boots making squish-squish sounds because I had yet to pour out the water. We’d been on a rampage. We were hungry. We found a Mexican restaurant and settled in. This was not where you’d normally find me on a December Sunday. It’s duck season, and I typically spend most of my weekends in a marsh in the Sacramento Valley. But California has way more to offer than just waterfowl hunting: At least 12 other small game and upland game species are legal in much, if not all, of December, and if you have a shotgun and a friend who has access to cattle ranches in Amador County, you can bag a lot of them. For my boyfriend Hank and me, Evan is that friend. He’s the fifth generation in his family to be born and raised in Amador County. He knows all the places to hunt. Or at least what’s left of them. Amador’s charm has made it a favorite retirement spot for those well-to-do Bay Area folks, and the minute they move in, they start posting no trespassing/no hunting signs. We’d met Evan that morning half an hour before dawn, and followed him to … OK, if I say any more I’d be saying too much, so I’ll just say Evan knows the combination for the padlock at the gate. Our destination: a wide spot in a creek lined with willows and cottonwoods where we might be able to jump mallards and wood ducks. We approached as quietly as we could, but every snapped twig seemed to ring loud in the frosty stillness. When we got close to the small levee that bordered the creek, we fanned out and made our way up the bank, looking at each other to make sure we arrived at the top of the bank simultaneously. I should’ve been looking forward – I was still looking at Hank when he fired the first shots. Easily six dozen mallards were lifting, at least two in shooting range. He missed, but the birds kept circling the area for a good 15 to 20 minutes. I hid in some brush in hopes some would come back, while Hank and Evan walked down the creek. Their strategy was the correct one. I heard shots, and they came back with a hen mallard in hand. A mixed bag on a perfect day with a shotgun. This was such a perfect duck hunting spot that I could’ve stayed here all day long and come out with a full strap, but that’s not what this hunt was about. It was our annual mixed-bag hunt. We had many more spots to hit. Next stop: A big cattle ranch pond, a known hangout for Canada geese. The pond was in the middle of wide-open and relatively flat space, but if we approached at a healthy distance then snuck in below the earthen dam, we might be able to jump ducks or geese on the pond. Coots. And maybe one bufflehead – a flash of white on the middle of the pond amidst all the black feathers. Oh well. Hank dispensed with the sneaking and started walking the perimeter, hoping to flush something – anything – out of the cattails at the shallow end of the pond. Nada, nothing, zilch. Until we heard the unmistakable “grack!” of two snipe getting up in front of us and launching into their zigzag flight. “Dammit!” Safety. He’s shooting a new gun this year and he was still getting used to where the safety is. There was no point hanging around here, so we went back to our cars, where we noticed some doves hanging around a cattle pen. “Get ‘em!” Evan said to me. I dug into the bag in my car for small shot and managed to get one before they all bolted. I was on the board, with our second species of the morning. Next stop: another cattle ranch pond, this one a little smaller and tucked into some steep oak-studded hills. We couldn’t hear anything as we approached the pond, so we didn’t know what to expect as we spread out and moved in. I watched Evan so we’d crest the earthen dam at the same time, and suddenly his gun was up. I bolted up the final step in time to see total mayhem. Mallards were exploding from the water. Wood ducks too. We all started shooting and ducks started falling from the sky. I got one! A greenhead. He was stone dead at water’s edge. In the confusion, a wood duck pair circled back in, and I dropped the drake. Most of the birds were now in the air getting out of there as fast as they could. I bolted up a steep hill after some of them, hoping at least one would be a cripple that was about to drop. Big mistake. My woodie was still alive, and not wounded as badly as I thought. He burst out of the water and flew the opposite direction. I shot through the cattails, but to no avail. Thinking there might still be some wounded ducks on the water, I rushed back to its edge and plunged in. I’m still not sure why I did this. I was not wearing waders, though I did have waders in my car. My hunting license was in my pocket. It’s the new California license, printed with ink that reportedly washes off in water. The only duck I could see was dead, and probably close enough to the edge that we could’ve gotten him with a tree branch. I didn’t care. Within three steps I was up to my waist, but I could reach the duck. I looked around quickly and, seeing nothing else to pick up, lurched back to the shore, duck in hand. Jubilant. I joined Hank and Evan on the dam as we surveyed our kill: four greenheads. I’d shot the head off of mine. We all agreed we should’ve had more, but we were quite pleased with ourselves, still buzzing with adrenaline. I was sopping wet, and grinning ear to ear. Back at our cars, we plotted our next stop: Now we’d be leaving ducks behind for an old-fashioned barn shoot at Evan’s family’s ranch. When we pulled up to the weathered caretaker’s trailer, we saw easily two dozen pigeons on the ridge of the corrugated metal barn roof – more than Hank and I had ever seen there. We love pigeon! We loaded up and walked through a gate calmly to avoid spooking them. Hank walked around one side of the building, Evan and I around the other side, and when the pigeons finally lifted, the shooting began. Evan dropped one. I dropped one. As I was reloading, a cottontail bolted from the grass in front of me, making a bee-line for a woodpile. I swung on him, but I’d left the safety on, and he was out of sight before I could fire. Evan and I were surveying our kill when we heard a shot on the other side of the barn. It was Hank. He’d gotten that cottontail. Normally, this barn shoot is a one-off. 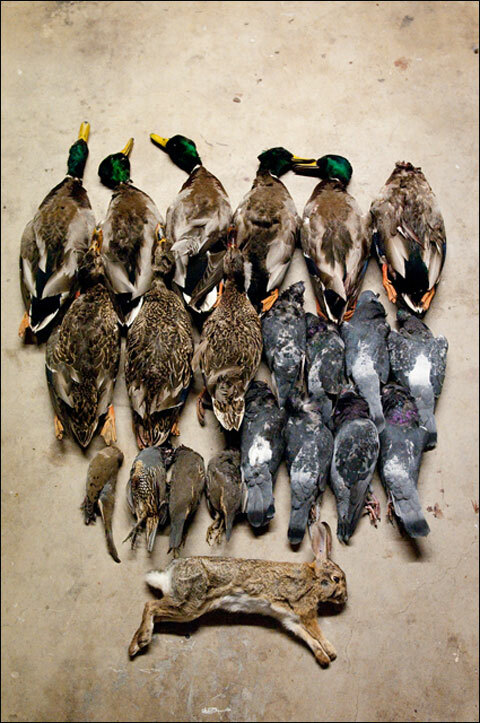 Once the shooting starts, the cottontails hide and the pigeons flee. But the pigeons weren’t going far, and we all had a feeling we could keep this going. Evan went down the hill, and Hank and I watched him for a while as he stalked a flock that was on the ground. We could still see some pigeons in the air, though, so we went back to the barn, hoping to hide in a shadow and get another shot. We were 20 feet from the barn when we looked up and saw a pigeon flying in. “Look, there’s one,” Hank said, and without thinking, I raised my gun and pulled the trigger. It cartwheeled down to the corrugated metal roof, and we could hear it rolling down the other side. “Wow! Great shot!” Hank said. I beamed. He’s the one who normally makes those amazing snap shots. A small herd of cattle stared at us as we headed out for the pond, swaying nervously, then bolting. “Dammit!” Evan said. We couldn’t see the pond’s surface, but we knew a thundering herd of cattle would tip off any ducks there to the presence of danger. The cattle stopped maybe 70 or 80 yards away from us. Then, inexplicably, they started running toward us. We started laughing. We couldn’t help it. After just a few moments, the cattle ran away from us again. Then back at us. Then away. Not bright, those cows. We knew we were screwed, but we went all the way to the tiny pond anyway. Couldn’t hurt to check. Once again we spread out and walked up the little earthen dam simultaneously. Mayhem! A dozen mallards burst from the water, gunshots rang out, and when it was all over, we’d dropped four – two drakes and two hens. This day was just amazing. Usually when we hunt our way across these cattle ranches, we’re lucky to get anything, but on this day, every single stop was fruitful. On our way out, we saw that the barn was once again covered in pigeons, so we stopped, loaded our guns with small shot, and wound up with three more birds. Then when we were just 20 yards from the ranch gate, we spotted a covey of quail under an oak tree. Seriously? Remember the scene in Caddyshack where the priest plays his best game of golf ever in a thunderstorm? This hunt was that good – it just kept going and going and going. None of us would’ve been surprised to be struck down by lightning. We stopped our cars, and Hank and I loaded up again. The quail dodged into a rocky outcropping and I looked for the best approach. They bolted on the other side of the rocks, and by the time I had a clear shot, I couldn’t fire because Hank was too close. But he got one – his first ever. I have to admit I was a little bummed. I really thought I’d be getting my first quail ever today too. What a spoiled brat, eh? We rolled into Sutter Creek for a late lunch with the bed of Evan’s pickup truck filled with our bag: Nine ducks, eight pigeons, one quail, one dove and a cottontail. We were famished and still buzzing with excitement. The waitress set chips and salsa out for us and we devoured it as we began reviewing every moment of the amazing hunt. What would we do for our finale? “Let’s go back to the creek!” I said. I really wanted another shot at ducks in that perfect little place. As we were pulling up to the spot where we’d park, Evan stopped his truck. There were quail on the road in front of us! I hopped out of the truck and loaded my gun as the birds disappeared into the grass on the left side of the dirt road. I walked, looking to my left, hoping something would flush, when I heard rustling in the grass on the right side of the road. Rabbit? Nope, nothing was bolting. I looked back to the left and heard that rustling on the right again. Stopped. The covey burst out of the grass. Without thinking I raised my gun and fired, and dropped my first quail ever. Grinning, I held it up for Hank and Evan to see. We stuck to our plan and walked over to the creek, but we found nothing but a lone hen mallard, who lifted and flew off long before we were close enough to shoot. With the sun sinking fast, we decided to go after more quail, and I got one more before it was over. What an amazing day. None of us had gotten a limit of anything, but it had been a great hunt. We’d gotten something at every stop, and we had what would be the makings of many great meals. This was shotgun life at its best.